The countdown begins. 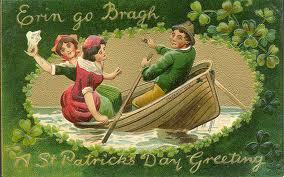 One month until St. Patrick’s Day! Why is this so important to chronicle? I’ll tell you why. There are a lot, and I mean a lot of fun things to cook and bake (and drink) for St. Patrick’s Day! In a way it’s more fun than Easter or Christmas. There is traditional lunch food, traditional desserts, traditional baked goods and it doesn’t revolve around chocolate which is quite a relief in a way. I’ll explain more in further posts. The important thing now is to get excited about the approaching holiday! And Éirinn go Brách ! My mother’s maiden name is Dugan I’ll have you know!